Brooklyn, New York artist Meridith McNeal continually wandered the streets of Rome during her Spring 2008 residency as a Visiting Artist at the American Academy. As she ambled into every nook and cranny of the city, from winding alleys to bustling streets, she took dozens of spectacular photos—of buildings and people, as well as of flowers, trees, plants, statues, monuments, chandeliers, light fixtures, and scrumptious looking food. Magical Things captures these images and presents them alongside McNeal’s own exquisitely-rendered drawings of everyday objects—her slippers, her computer cable, her coffee pot, among them. Coupled with brief notations—culled from e-mails written to her friends and family detailing her observations and feelings—the book will inspire profound wanderlust in even the most committed couch-sitter. While it’s easy to take McNeal at her word, she doesn’t want readers to do so. Indeed, she peppers her account with quotes from people who, like her and Shelley, have been charmed by the country’s natural and human-crafted beauty. Observations from writers including Susan Cahill, Erica Jong, Bharati Mukkerjee, and reporters from the Time Out Guide to Rome add to the delightful mix and give McNeal’s musings a timeless quality. Magical Things is visually stunning, and while the sixty-four-page text could easily have been more comprehensive, the focus on Rome’s magnificent beauty entices the reader into wanting to throw caution to the winds and book a flight. 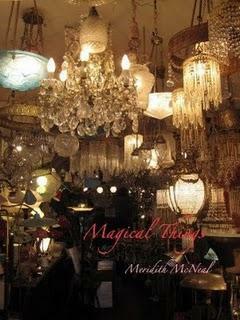 Indeed, there’s magic here as McNeal inspires adventures both real and imagined.